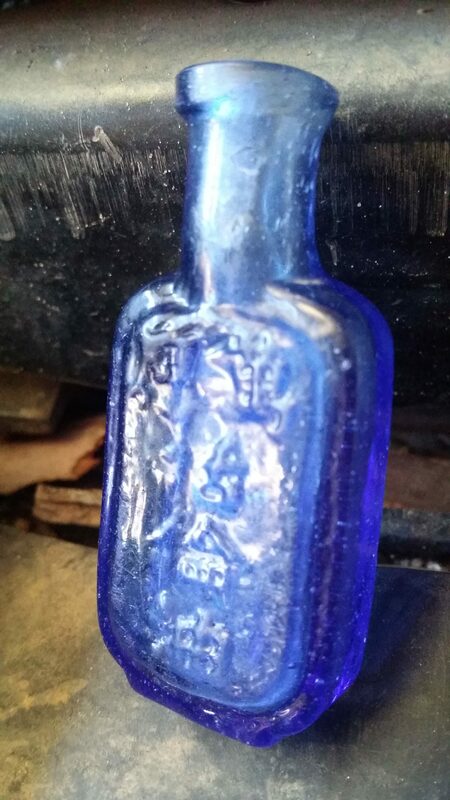 My grandfather left me a small blue bottle that has Chinese characters embossed on it. He showed this item to me a few years prior to his passing. At the time I thought he was indicating that this would be mine when the time came because I was the only family member who was interested in our Chinese heritage. My initial thoughts were that the bottle once held opium. This was based on the myth that all Chinese on the Bendigo goldfields were opium addicts. After further investigation and research I have since learned that the bottle is more likely to be a vial that once held poison. Opium is a black gooey substance that could not easily be poured into and out of such a small bottle. The vial is made of blue glass. It has a rectangular body with curved corners and a flat base and sides. There is a cylindrical neck protruding from the top. The ratio of the body to the neck is 2:1. There are Chinese characters embossed in a vertical line down the front of the vial. The dimensions of the body is 37mm x 24mm x 12mm. The length of the neck is 15mm and the diameter is 13mm outer and 8mm inner. The weight of the empty vial is 25 grams. There are several indicators that this vial was hand-made. As there are no seams on any part of the vessel, it is likely that a clay one-piece dip mould was used to shape the body and the neck. The flat laid-on rim around the lip of the neck has an irregular inner diameter and outer thickness. It would have been placed on the vial afterwards. This style of rim is characteristic of patent medicine bottles manufactured in the period 1840’s to 1880’s. Imperfections in the glass indicate that the vial was mouth-blown. These include – the back surface and the sides have irregular vertical stretch marks; the surface of the bottle is not smooth and appears to have the texture of ‘orange peel’; and an unusually high quantity of air bubbles, some of which have burst through to the surface and are elongated. There is an internal crack in the back of the vial running from the shoulder to the base in an arc. The vibrant blue glass is manufactured by adding the chemical compound cobalt oxide or cobalt carbonate to the glass. It is referred to as cobalt blue after the German kobold ore (translated as goblin ore) named so by European miners because it contained very little metal and gave off poisonous arsenic fumes when smelted. Cobalt blue glass has been manufactured since ancient times; the earliest evidence comes from Mesopotamia in 2000 b.c.e. The Chinese began colouring glass with cobalt compounds under the Chou dynasty (112 – 221 b.c.e.). Presumably, my vial was manufactured in China sometime from the 1850’s onwards when poisonous substances came on the market in distinctive cobalt blue glass bottles across the world. The poison bottles had characteristic patterns like latticework, deep grooves and skull and crossbones to prevent accidental poisoning. They also had embossed lettering of the words ‘POISON’ or “DEATH’ down the front or side of the bottle. Perhaps the Chinese characters on my vial spell out a similar warning. It is because of these distinctive features that cobalt blue poison bottles are popular items to collectors and treasure hunters. Chinese bottles are often found discarded in locations where Chinese immigrants worked and settled in the nineteenth century. For example, the gold rush towns of Central Victoria, Australia and British Columbia, Canada. I have found images of the same type of blue vial as the one my grandfather gave me in two separate collections. One of the vials was found on the Bendigo goldfields in Eaglehawk, Victoria. It was dug up with other items found whilst fossicking. The other example was dug up in Vancouver, British Columbia, Canada and forms a collection of various cobalt blue Chinese and Japanese poison bottles. When I received the blue vial I assumed that it was an item that had been passed down through our family and was something that was once in the possession of our Chinese ancestor James Wang Ah Ling. I felt very honoured to have received it. I have since learned that the item was found down an old mine shaft by my Uncle and my grandfather when my Uncle was a teenager in the 1980’s. Although this fact has changed the meaning and the history of the vial it has in fact given it more value. Rather than a long treasured keepsake from a proud family history it has become an item that symbolises many aspects of our forgotten Chinese heritage. The vial was found as a discarded object down a mine shaft in an abandoned landscape of the Bendigo goldfield. As was our Chinese heritage, discarded and hidden when policies like the Commonwealth Franchise Act 1902 which disqualified people of ‘coloured races’ from voting in the first Australian Federal Election of 1903; and The War Precautions (Alien Registration) Regulations 1916 requiring citizens of non-British descent to complete a Form of Application for Registration as an Alien were enforced. These policies directly impacted the life of James Wang Ah Ling and his descendants and led them to hide their Chinese heritage. The little blue vial represents a newly discovered heritage and connects me with my grandfather who was trying to re-introduce it to me. We held a shared respect for the Chinese community and I now have something that I can pass on to my children. When handling the little blue vial it moves smoothly across your fingers -a pleasant experience. It is a tangible piece of material culture that compliments the family story which I have recently published and shared with the descendants of James Wang Ah Ling. A North American Pioneer Chinese Virtual Museum, ‘Bottles, Jars and Wooden Items’, http://www.chinesecol.com/treasure.html, Accessed 9 May 2017; Australian Government, ‘Federal Registration of Legislation’, Commonwealth Franchise Act 1902, https://www.legislation.gov.au/Details/C1902A00008, Accessed 11 May 2017; Australian Government, ‘Federal Registration of Legislation’, The War Precautions (Alien Registration) Regulations 1916, https://www.legislation.gov.au/Details/C1916L00165, Accessed 11 May 2017; Antique Medicines, ‘Old Bottle Identification and Dating Guide’, http://www.antiquemedicines.com/bottletypes/bottletypes.htm, Accessed 8 May 2017; Darren Maher, Facebook post, “Thornetree Genealogy Page’, https://www.facebook.com/pg/ThornetreeGenealogy/posts/?ref=page_internal, 2 May 2013 23:43; Encyclopaedia Iranica, ‘Cobalt’, http://www.iranicaonline.org/articles/cobalt-sang-a-lajavard-blue-stone-also-applied-to-lapis-lazuli-and-ultramarine-lajavard-e-kasi-ceramic-blue-la, Accessed 11 May 2017; Lyndal Simmonds, , The Murderous Assault at Dead horse Flat and Other Tales of the Life and Times of Anastasia Maher & her Descendants, Hallett Cove, L. & P. Simmonds, 2016; Paul Simmonds, Chinese Medicine Bottle, 2016, Personal collection; Society for Historical Archaeology Inc. [US], ‘Bottle Typing/Diagnostic Shapes’, https://sha.org/bottle/miscellaneous.htm, Accessed 8 May 2017; Society for Historical Archaeology Inc. [US], ‘Bottle Body Characteristics & Mold Seams’, https://sha.org/bottle/body.htm, Accessed 8 May 2017; Treasure Net, ‘Imperial Blue Chinese Medicine Bottle, Cash Coin and Silver’, http://www.treasurenet.com/forums/today-s-finds/97999-imperial-blue-chinese-medicine-bottle-cash-coin-silver.html, Accessed 9 May 2017.; Wikipedia, ‘Cobalt’, https://en.wikipedia.org/wiki/Cobalt, Accessed 11 May 2017. Were there Chinese settlers in Quambatook John? I just want to tell you that I am new to weblog and definitely savored you’re blog site. Probably I’m likely to bookmark your blog . You absolutely come with impressive stories. Cheers for sharing with us your web page.